A word of warning before I begin. Repairing crochet is time consuming! I'm talking super sloooooow. 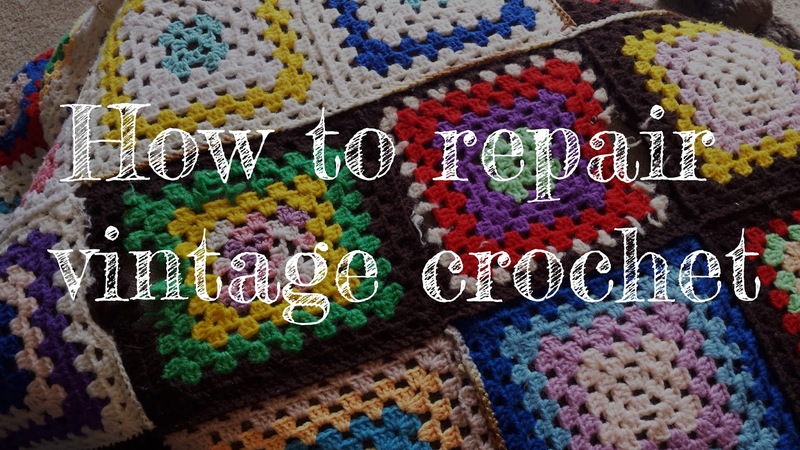 You could probably crochet a new blanket faster than some take to repair but then you wouldn’t have the stories, history, sentimentality, fuzzy well-loved texture and downright awesomeness that a vintage crochet blanket brings. 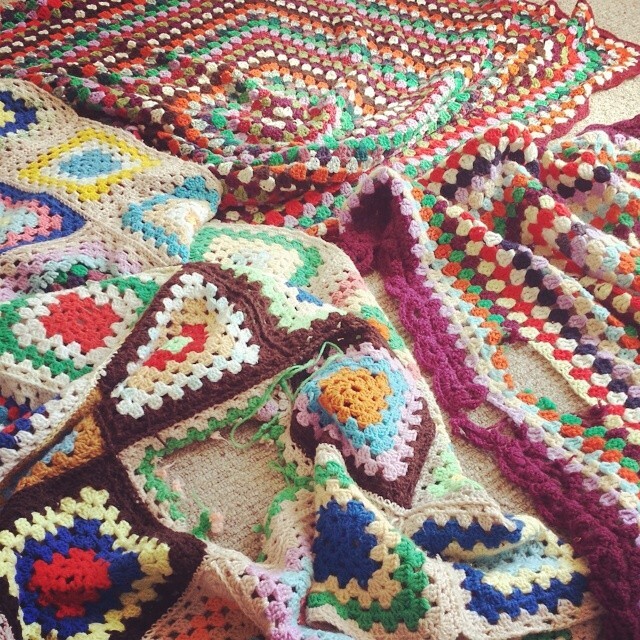 Someone took a lot of time, effort, love and, if they were anything like me, several colourful swear words to make that blanket once, so repair is the way forward. 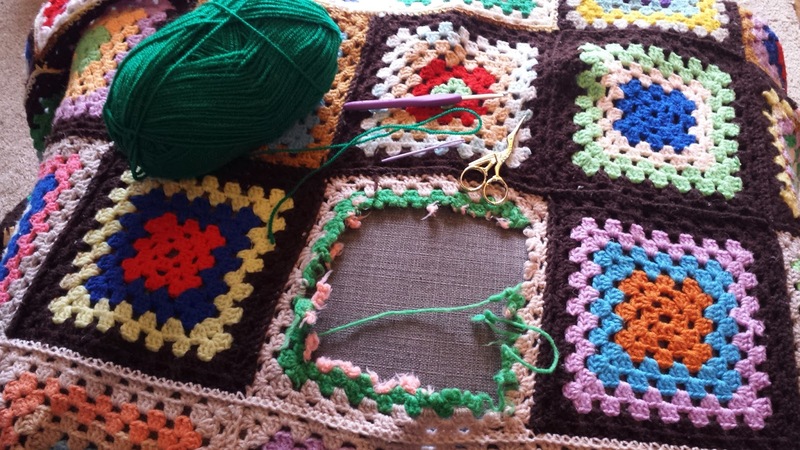 I always feel a little sad when I see a lonely threadbare crochet blanket in the window of a charity shop so if you see one, rescue that poor thing, bring with home and give it some attention! 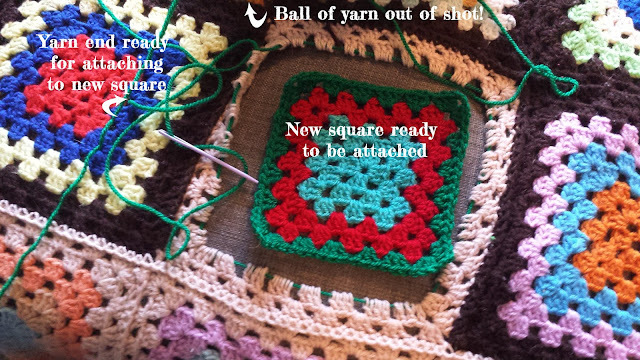 For this tutorial I am using a granny square. This method will work just as well for granny stripes and pretty much any other crochet pattern. Yarn. 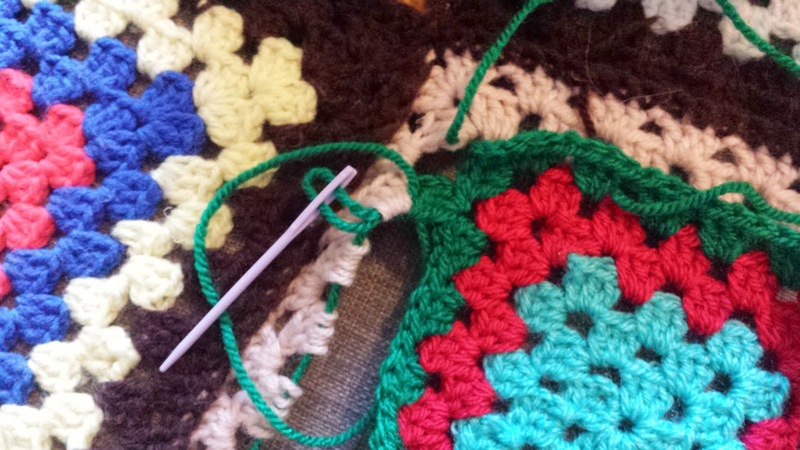 Remember that stash of brightly coloured (probably cheap) acrylic yarn that you bought when you first learnt to crochet and don’t use anymore but don’t have the heart to get rid of? IT JUST FOUND ITS PURPOSE PEOPLE! Most of the old blankets I have seen / fixed are acrylic as any pure wool will have been long since destroyed by moths or are still kept as family heirlooms and won't pop up in a charity shop. Drag out those yarns that you now, as a total yarn snob, are embarrassed by and give them a cuddle. You missed them really. Don’t deny it. A crochet hook. I tend to roughly gauge the size that was used by eye (generally a 4 or 5mm) and go down a size. It’ll stretch over time and you don’t want your repair sections to be baggier than the original after a few washes! A large eye needle. Cheapy plastic ones tend to be the easiest for a job like this. Slow and gentle is the way forward here. 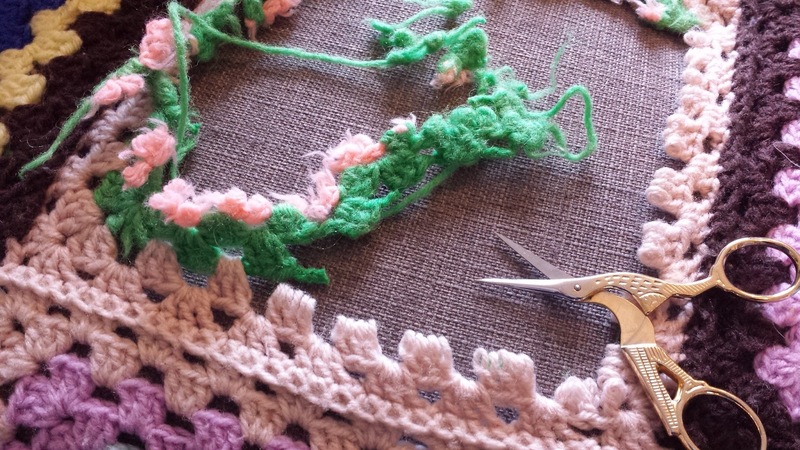 You may find the old yarn is felted around itself or knotted into a total mess and you don’t want to make it any worse! Carefully snip away any of the damaged areas. More often than not you will need to cut away more than you think so don’t panic! It will look worse before it gets better. Work your way back to a level where the original yarn is strong enough to hold. Be careful not to un-twist the loops of the original crochet you wish to keep. 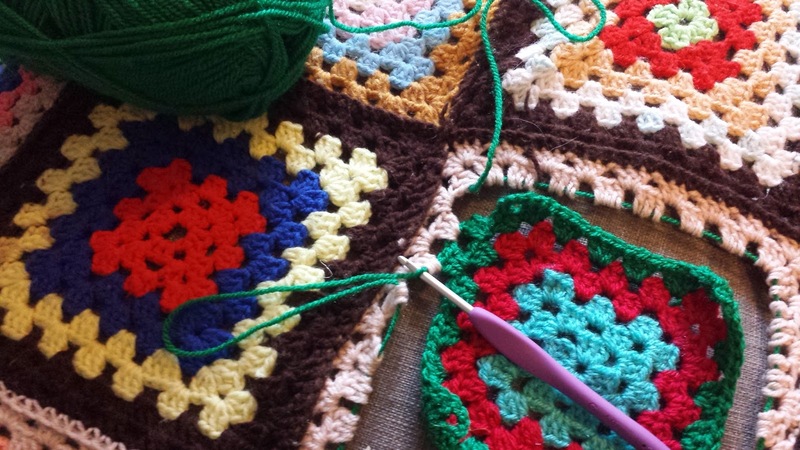 Thread your yarn through your needle and then take the needle through the loops you wish to keep WORKING IN THE OPPOSITE DIRECTION to which you would normally crochet. 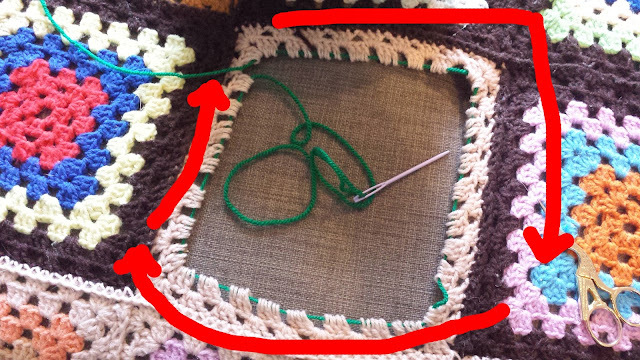 If you are right handed, thread the yarn from left to right. 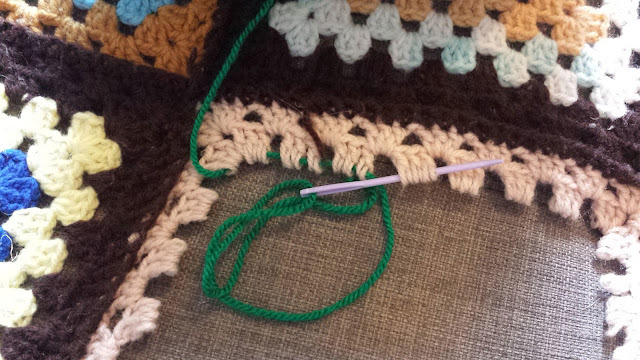 If you are left handed, thread the yarn from right to left. This yarn will be your working yarn from which you will crochet your new stitches. 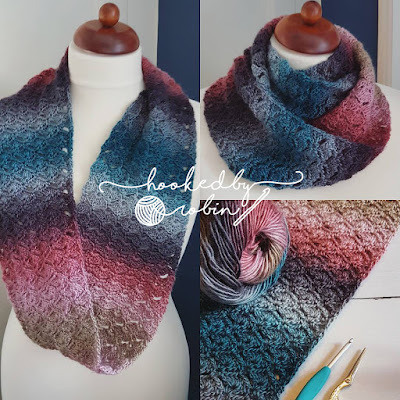 You want to make sure you have carefully picked up all the loops from the old crochet stitches and that you have threaded your new yarn through them all. If you are repairing a larger section, such as in this case, complete the rounds of your new section. Pick up the end of the yarn you threaded through the original loops. 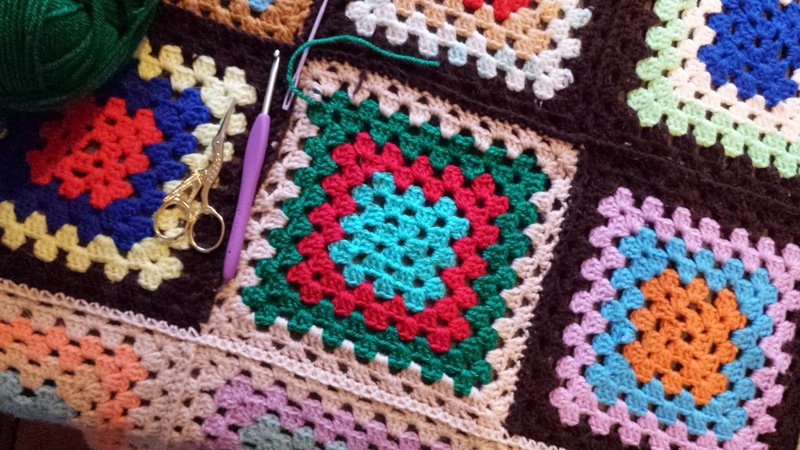 Make a slip knot and attach to your new square. 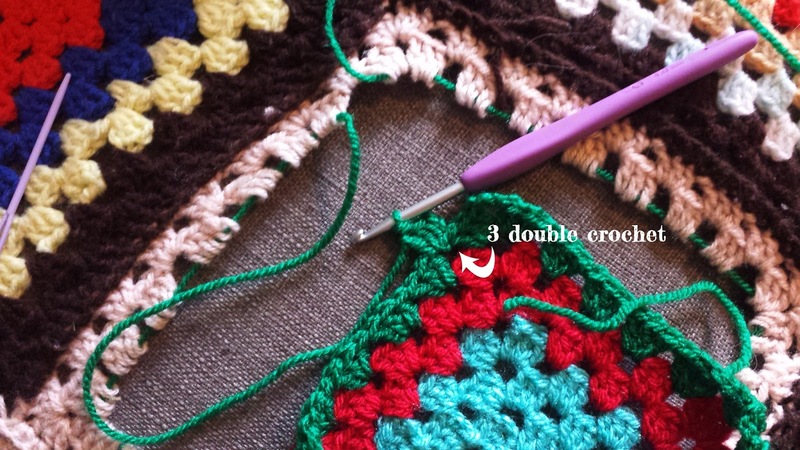 Crochet your first 3dc cluster (UK trebles!). 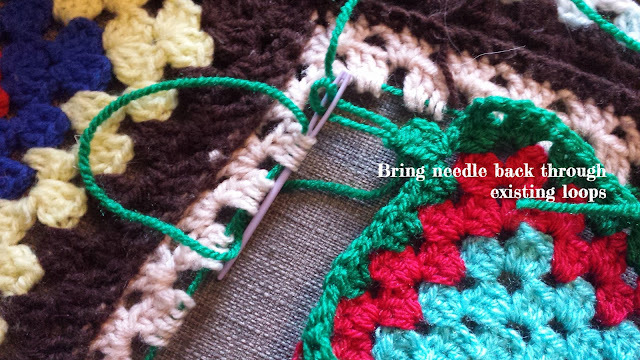 Remove your hook and thread your working loop through the needle. You may wish to pull your loop up a bit longer for this. 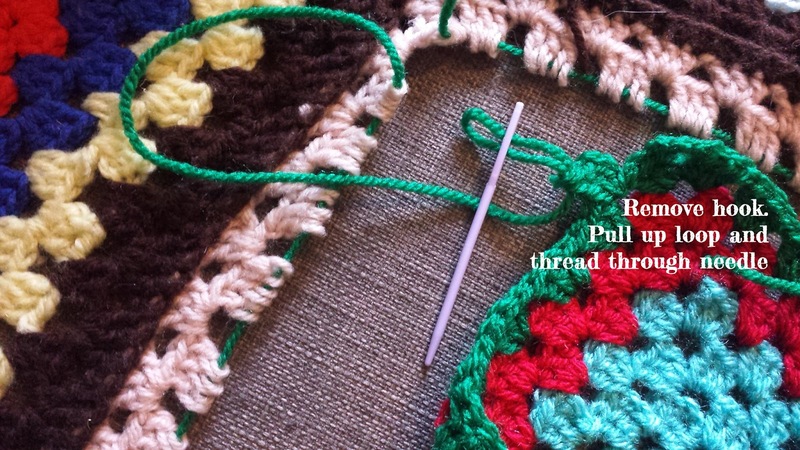 Pass your needle back through the original stitches above, be careful not to push too hard or you may split your working yarn and get in a tangle! Pull the needle, loop and any excess yarn through (a bit of brute force may be required! 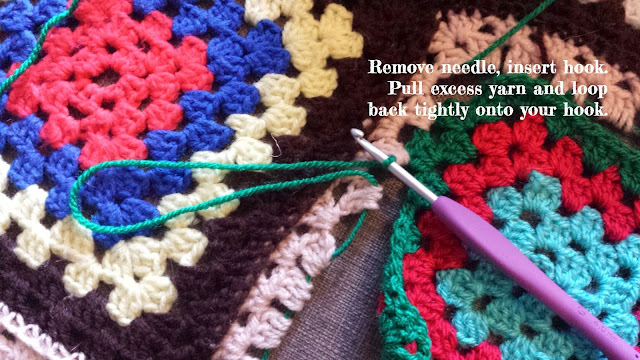 ), reinsert your hook and pull your yarn tight again. Complete your next 3dc cluster. It is fiddly and time consuming so don’t rush yourself. 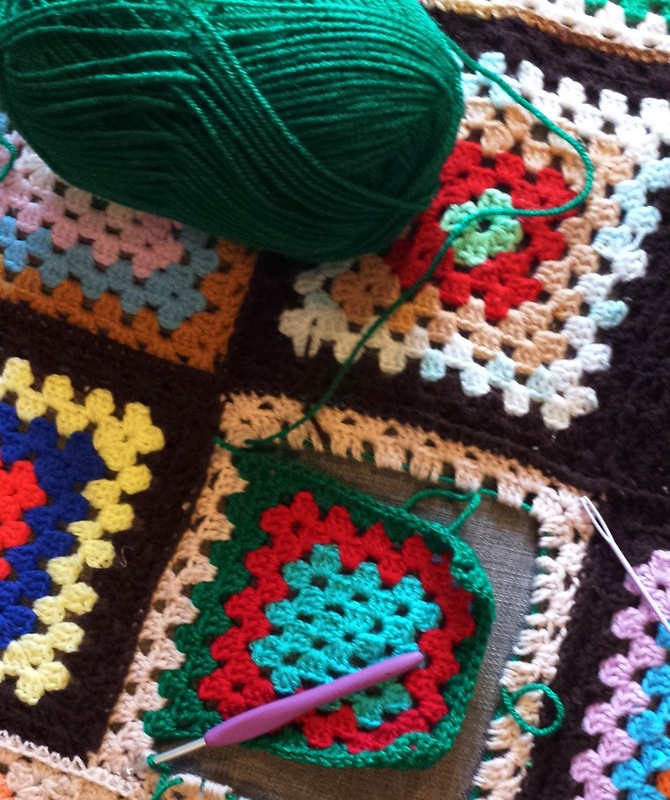 It is also VERY easy to misalign your clusters and not notice until the corners that your square isn’t square! I totally didn’t do that when taking these pictures for this tutorial … honest! HA HA FAIL.